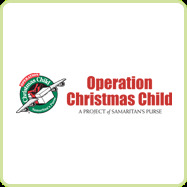 Operation Christmas Child is one of the easiest and most obvious ways to give to children in need. it's also one of the easiest ways to get your own children involved in giving. there are more than 8 million needy children in 130 countries around the world who will receive a shoebox that could change their life. how? because people like you and me, people with stuff, pack the shoeboxes full of little gifts for little children. people like you and me cover the shoeboxes in prayer. people like you and me deliver the shoeboxes to children who have nothing. no hope. no faith. no shoes. nothing. my family has packed shoeboxes for Samaritan's Purse Operation Christmas Child for 4 years, and i see it a longstanding tradition for many generations to come. why? because we are consciously cultivating a heart for giving. a heart for the hurting. a heart full of gratitude. a heart that wants to help others. a heart for sharing the Gospel. it's not all about us. i take my kids to the dollar section at Target and the Dollar Tree to shop for our "friends" in a faraway country. i let them pick out things that they would like. we pack the shoeboxes full. BigGirl puts in a handwritten note decorated with hearts, sunshines and crosses. Bubba will color a picture, using every color under the rainbow, and fold it up to tuck in the boxes. we will pray for the children, and for everyone in the journey of the shoeboxes. it's the very least we can do. there you can also find places in your area to drop off your filled shoeboxes. collection week is November 15-22.
can you give a shoebox to children in need?